There are days when all of our lives turn Topsy Turvy and Bah Humbug! I totally lost my followers list for over a week and then it miraculously reappeared. I totally lost my link list gadget...my dot com blog still doesn't show it but if I switch to blogspot.....there it is! It's a hassle to switch back and forth because sometimes it tells me I don't exist and I'm pretty sure that in my own personal reality..I do! As a result, my blog is not updating on your blog unless I double post under two identities...dot com and blogspot dot com. One day, it took me 13 identity changes and repostings to get it to show up. I gave up at the last post so only the post before shows on your blogs. I'll double post this one so I show up on your gadget link lists, but then I will probably disappear from now on. However, your link lists still might not update for me. Only recourse is to 'follow me'. I'm sorry about that. But I've tried everything, looked up everything. Nothing is working. Just posting this made me disappear for 10 minutes. I couldn't find me anywhere!!!!! And each and every time I get a '404' blog does not exist..I have a full fledged panic attack. Not a good thing. My friend Mary Lou Weidman lost her blog of 6 years to the black hole of Google. She lost all her followers and folks can't find her. Well, she's not lost, she's here on her new blog Mary Lou and Whimsy Too Mary Lou is an amazing lady and a very talented story quilter and a wonderful improvisational free-piecer. Her flowers, and birds, and butterflies make my heart sing. Hop on over and meet her, bookmark her new blog and tell her Michele Bilyeu sent you! Photos keep disappearing for all of us whether we are dot coms or blogspots dot com. Check whether you are using 'new editor' or 'old editor'. I like the old because I can make my photos any size I want and need them to be. My 'new editor' has been trying to tell me what to do. And I don't go along with that at all...just ask my husband! Other than that and 11 years of not sleeping and hot flashing in 100º heat in my upstairs sewing nook...the loft area is open but the nook only has a tiny solar tube window opening and the sun is definitely coming in...things are still going strong around here! I actually sewed the binding on three quilts yesterday...now that is a personal best for me! I may have sewn them inside out and backwards but they are on and staying that way! Unfortunately, members of the terrorist underground ate the wires under our house so we no longer have air conditioning upstairs and since the heat pump had is own hot flash and blew its gasket, we no longer have air conditioning downstairs either. So, sewing and quilting have become endurance challenges for me. I got a new art quilt registered at AAQI today...time for entering your quilts if your do the Quilt a Month challenge! Everything is a challenge for me on most days...but that one I love! And don't forget the Alzheimer's Art Quilt July Auction runs through July 10 at 10:00 pm..lots of postcards this month from some very talented quilters. Check them out and consider a bid or buy a quilt on sale for someone you love!!! We have cared for my mother in her Douglas Island, Alaskan home for the past 6 years. The sun, the moon and the stars shine, the ocean's waves go in and out, and the winds blow. But it is the constancy of the chaos of Alzheimer's Disease that turns our world "topsy turvy". Yep...that's how life is, most days around here..google eats our blogs, the undergound terrorist ate our house wires, and solar flares are both inside and out. Help me out and buy one of my quilts, puleeze! Remember my quilts and all auction and sale monies go directly to AAQI and all AAQI profits fund Alzheimer's research! Thanks and blessings to the quilt buyer!!!! Now...we need someone with someone in their family who broke something, is grumpy over something, or is having lots of bah humbug days.....so you can buy my last for sale quilt for them!!! Michele Bilyeu of With Heart and Hands quilts for AAQI and runs the AAQI Liberated Challenge..won't you join in all of her fun...donate or buy a quilt, today! There seem to be a lot of issues lately with blogger. I had some sign-in problems but nothing more. Knock on wood. I find your posts through FB which is pretty reliable. I really like your little topsy turvy art piece. Says alot. Technology. Sometimes you love it and sometimes it hates you. Sorry for the trouble with your blog. I'm such a wuss when it comes to the heat and I sympathize with you. If our air conditioner ever gives out I'll be a goner! I love coming here, never gonna know what you're doing or what you've been up to and you make me laugh so hard! It sounds like you continue to find ways to keep your sense of humor about it all. The quilts for Alzheimers are wonderful as always. Summer has begun here and its 30 degrees C( quite hot for here) I am sitting with a fan blowing on me and reading blogs, eating blueberries and mulling about my newest quilt project. Are you going to Sister's this weekend to the show? The Gee Bend girls are going to be there I think. Wow! I don't think I've had those kind of issues with Blogger - what a hassle! Are you ready to move to Wordpress or Typepad or some other provider yet? 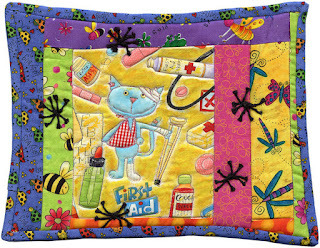 Your Topsy Turvy Quilt is quirky and colourful - I really like it. I hope someone buys it real soon. Thanks for the heads up on Rene. Was wondering where she got to. Oh poor you - no aircon. It's been so hot here I've been unable to sew, just rip! Now it's gloomy and overcast again, but we're off to do the weekly grocery shop so I can't sew (sigh). I've been having difficulty commenting lately and sometimes with uploading pics. Such a pain! 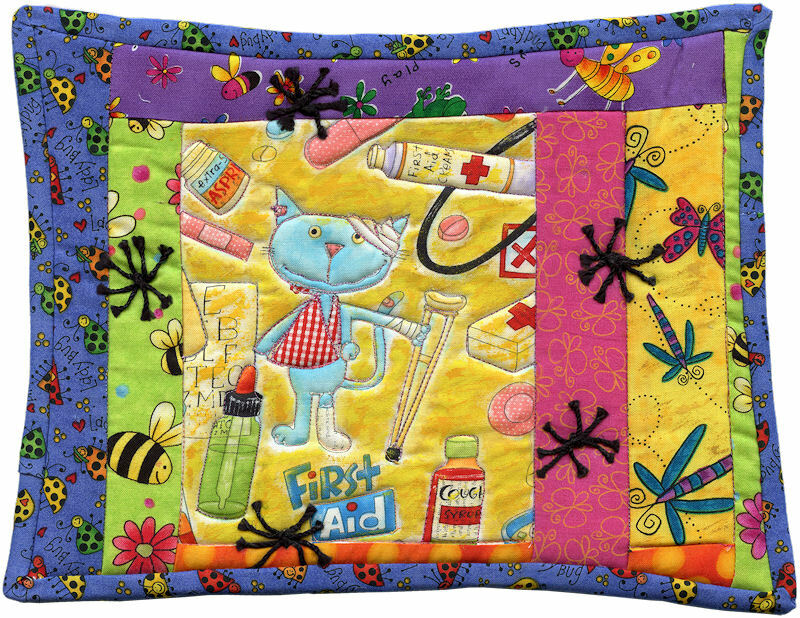 Love both of your new little quilts, especially Topsy Turvy. Great colors, cheerful, light-hearted.